Gordon Brown is a vocational case worker who helps people get back into the workforce, and has conducted mock interviews well into the triple digits. For weeks – months – you’ve been poring through job postings. You’ve painstakingly tweaked and refined your resume. You’ve filled out application after application and it’s finally paid off. They’ve offered you an interview – your chance to sit down and explain what makes you the best man for the job. Even for seasoned professionals, the interview can be an intimidating process, and for those of us with a few years of part-time work in college, it can be downright terrifying. 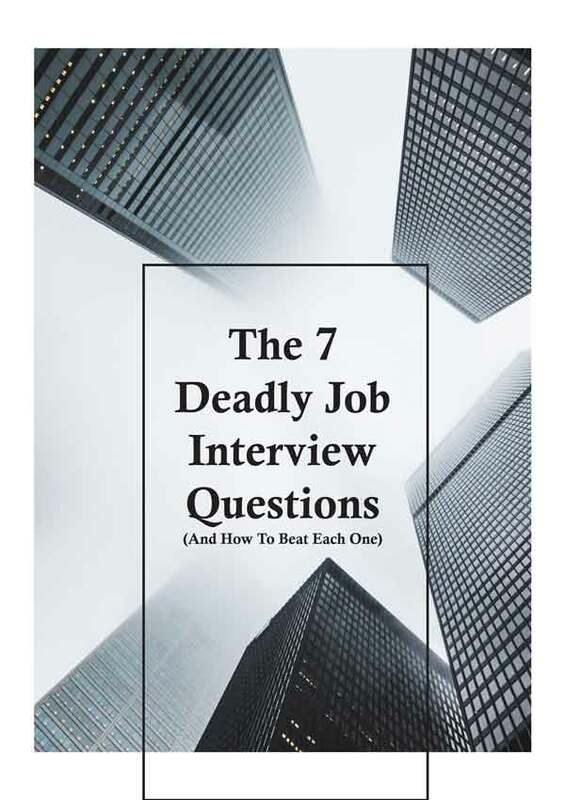 And while the interview is always going to be tough, with practice, preparation, and the knowledge of why you’re being asked these questions, you’ll be able to outsell people with twice the experience. These are the seven toughest questions you’ll encounter, and the secrets to acing every single one. This question can be a frustrating one, especially if it’s being asked in an interview for a “survival job.” We have rent to make, bills to pay, and student loans looming over us like a tsunami made out of anxiety and despair – why else would we want to work here? But that’s not what’s being asked. In actuality, this question is an invitation to describe why you believe you’re a good match for the company. It’s not “what do you hope to gain from us?” but rather “what do you want to do with us?” You need to show here that you’re a fundamentally good fit – that you value the same things they do. Memorizing the company’s mission statement isn’t necessary, having a solid grasp of it is. Now you might think you’re prepared for this one already – hell, it might even be simple. You just hit ‘em with your best skills when it comes to your strengths and coyly slip in an obvious positive when they ask for your weakness, right? As well-meaning as that tactic might be, it’s painfully outdated and detrimental advice. Don’t insult the employer’s intelligence by trotting out some cliché non-answer they’ve heard a hundred times before. “My greatest weakness is that I’m a perfectionist,” “I’m a workaholic,” “I pay too much attention to the details” – none of these do you any favors. Don’t veer the other way either. While it’s less common, there are folks who are far too honest about detailing their faults. They’ll confess punctuality issues, massive gaps in their knowledge, a tendency to eat their coworkers’ lunches, and so on. And they do all that without telling me what they’re doing to fix it, because that’s the secret there. You Can Accurately Self Assess: Employers want workers who have a clear and critical understanding of their own skills and abilities. 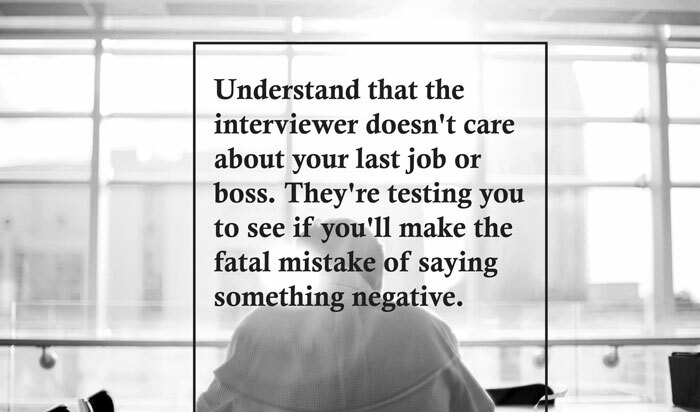 It’ll show the employer that your judgment is trustworthy, both in the interview and on the job. You Take Initiative: Describing your course of action shows that you don’t need a supervisor to get on your case about fixing something – you address things on your own time and on your own dime. Self-reliance and self-sufficiency are fantastic qualities in employers regardless of the field or position. You Can Develop: Any employer worth their salt knows that the interview isn’t about finding someone to hire, it’s about finding someone they can invest in. Your ability to develop and grow are key qualities, and potential is – as strange as it may sound – more important to employers than perfection. Much like “what’s your greatest weakness,” this question (and the variations on it) are “trap questions” designed to get you to slip up and take yourself out of the running. You may be tempted – sorely tempted – to exact some righteous vengeance here. You could vent about your moronic boss, your lazy, incompetent co-workers, your ungrateful clients, your impossible deadlines and how the office smelled vaguely of expired milk. Make no mistake – do that, and you might as well just get up and leave because you are not getting hired. Sample Response: “I can’t think of anything really wrong with my last job.” You’re not being dishonest here – you’re giving a coded answer to a coded question. The hiring process is one of the biggest expenses any business can incur. Searching for, interviewing, and onboarding new employees can be time-consuming and costly, and turnover can run into the tens of thousands of dollars. 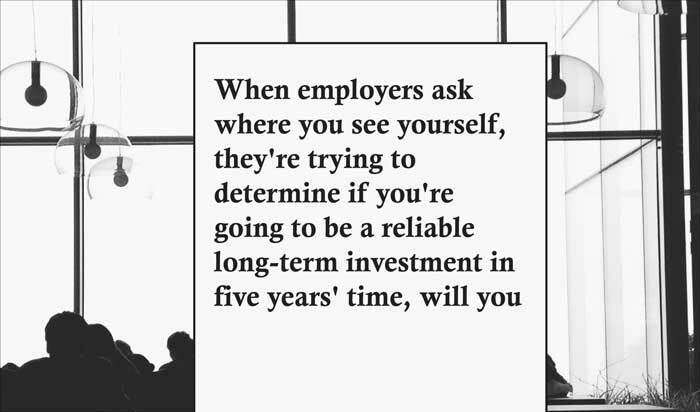 When employers ask where you see yourself, they’re trying to determine if you’re going to be a reliable long-term investment – in five years’ time, will you still be working for us? Other folks will stray to the other extreme and say that they have no idea where they see themselves in five years. True as that might be, all that they’re saying is that they’re either fundamentally unreliable or unfocused. Of course, nobody knows for certain where they’re going to be in the future. Maybe some family emergency will force you to relocate. Maybe an unbelievable opportunity will present itself. Maybe the supervolcano beneath Yellowstone will finally erupt and plunge the world into an eon of darkness next Tuesday – stuff happens. Be that as it may, you need to tell the employer what they’re looking to hear: An ambitious but reasonable estimate of where you’d be in their company within five years. Ambitious to show that you intend to be a better worker than you are now. Realistic to show that you’re not going to quit in frustration just because you haven’t been promoted after thirty days. Explain, concretely and concisely, the ways you intend to grow as a professional in the next half-decade – what skills you’ll learn, what abilities you’ll develop. Granted, this isn’t so much a question as it is a prompt, but there’s not an interview out there where you won’t be asked to give an example of how you’d deal with a difficult customer, resolve a conflict with a coworker, or organize a frantically busy day. 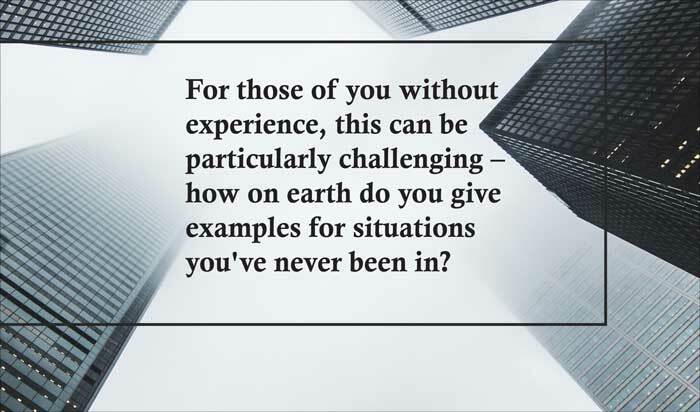 For those of you without experience, this can be particularly challenging – how on earth do you give examples for situations you’ve never been in? Simply put – you don’t. That’s not the point here. Though employers are always eager to find people with real-world experience, stating what you would do is what really matters to them. Can you show good judgment when the issue arises? Can you behave calmly and confidently? Can you keep the employer’s best interests in mind while still fixing the problem quickly and effectively? These are the things the interviewer is actually trying to ascertain here. For those of us who have been in these situations, our goal should be to place emphasis on your assessment of the situation and the reasoning behind your action. Even if you don’t give a technically correct answer, showing employers why you came to that conclusion can still chalk this up as a win. Never mistake the interview for a test of your competence; the interview is a competition. There are a dozen other people with similar skills and work histories waiting in the lobby – what makes you different? You could play to some unique strength – a language, knowledge of a certain program, etc. Feasible, but for folks coming out of college with limited real-world experience, that can be tough. Fortunately, there are other options. Consider selling yourself on attitude, personality, and perspective. You could present yourself as an indomitable optimist, capable of soldiering on with a strong back and a willing spirit no matter how tough the job gets. You could go for a cutthroat approach, telling the employer that what they need is someone who the company’s bottom line on their mind at all times. You could even use a lack of experience as a selling point, telling employers that you’ll learn to do the job exactly to their specifications. There’s a way of spinning anything – find your angle. There is a certain Kafkaesque genius to it – these questions are designed to throw even skilled professionals off balance, giving the employer a chance to see how quickly you think on their feet and how your thought process works. Much like the “give me an example” prompt, your goal here is to showcase your thought process and personality. When it comes to these “behavioral” questions, a unique answer can be more correct than a “correct” answer. That said, some questions (favorite music, hobbies, etc.) should be taken at face value. The employer’s going to spend eight-plus hours a day with you – most want to know that they’ll be able to get along with you. It’s not enough to simply answer these questions, you have to do so with determination, poise, and unwavering confidence. Regardless of where you are in the employment process, Primer has you covered, from searching to resumes to even more expert resources on mastering the interview. You’ve got the answers, folks. What's the most challenging (or stupid) question you've ever gotten in an interview and how did you handle it? Share your story below! As a teacher, the standard business interview is so foreign to me. I’ve definitely heard the first three questions many times, but most teacher interviews are done by administrators who have little to no human resources experience. As the post above states, the question I use is designed to see how quickly a candidate can think on their feet and test how creative they can be. How often do they mention stabbing people with the pens? If they did mention it, would you hire that person? Yes I did and stayed in the position for a year and then moved up in the company. They found that I was actually way overqualified for the position I had initially applied for. I had an interview recently when the recruiter threw me off with “What is the biggest mistake you made at your last job?”. I pretty much used the opportunity to answer the question directly but then go on to say what I learnt, and how my working process had changed to ensure the same mistake wasn’t repeated.